Upgrade QQ browser and the server will respond to your request faster, relative to the speed upgrade will make your old surprise. Just take some time, you can play QQ games, read news, look at function, send and receive mail, or management of bank accounts. To provide enhanced QQBrowser, "flip around" two sets of style shortcuts so that users can use different custom setting very easy. Unique energy saving, high-compression techniques to save you more power, flow, so you get more online time. Internet web site contains not only more but also to upgrade the WWW conversion engine Skeeter, to provide you with more professional Internet services. The new skin editor, no longer limited to only select the default skin, together participate in the design of your skin! Upgrading Krill rendering engine, even the most complex web mapping, the effect of rendering pages with the effect of designers we can be. HTTP, Web navigation, traffic statistics, full screen browsing, intelligent input and other auxiliary functions for mobile Internet easier to use. Krill QQ browser rendering engine to provide the driving force that is responsible for display graphics, rendering the font, adjust the page layout, and provided for the upper interface to support a variety of interactive details. Krill has advanced rendering techniques, even if the requirements are too stringent to run complex web pages, still show extremely fast performance. QQ browser integrated the new version 1.0 Krill, the speed of rendering pages with the old version has been greatly improved. Skeeter is the WWW rendering engine, to provide access to WWW browser QQ web services. Skeeter provided is not a scaled-down mobile version of the original page, it will in the core content of WWW pages selected at the same time adjust the page layout to accommodate the mobile screen display that allows you to enjoy the best mobile phone to read the WWW pages. Regardless of the access method, Skeeter provide you with the most stable access. 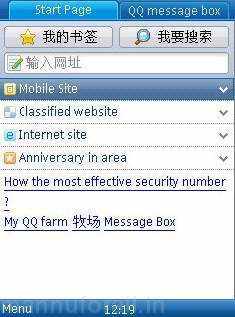 - Name officially changed to "Mobile QQ browser", and use the beautiful new Logo. - Several amendments to the bug page shows the abnormal.